At the Solar Power International conference in San Diego, California Gov. Arnold Schwarzenegger says it's important to focus on solar and the environment in a difficult economy. In spite of economic troubles, it's an important time to focus on the environment, California Gov. 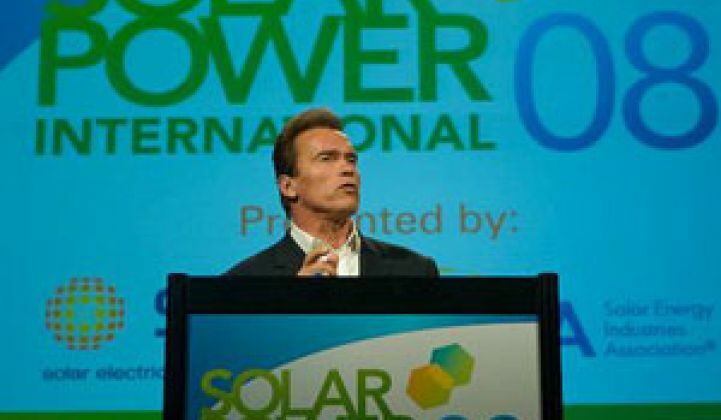 Arnold Schwarzenegger said at a solar conference Monday evening. "Of course we are now facing tough economic times, but that's why we need to focus on solar and [the environment]," he said. "We should not listen to those who say [that] should take a back seat. That's just plain wrong." For example, California's 2006 global-warming bill – which aims to bring state greenhouse-gas emissions to 1990 levels by 2020 – will boost the economy and increase green jobs, he said. Speaking at the Solar Power International conference in San Diego, Schwarzenegger said the conference had doubled in size since he last spoke there in 2006, when the event was held in San Jose. He added that he was happy for an excuse to come to San Diego. "Let me tell you, in San Diego 80 percent of the people voted for me in the recall," he said, referring to the election in 2003 in which Californians voted to recall his predecessor, Gray Davis, and to replace him with the actor. "The other 20 percent never forgave me for my movie, "Hercules in New York," which is completely understandable." He also mentioned the $18 billion in renewable-energy tax credits that Congress approved - and President Bush signed – along with the $700 billion bank bailout plan earlier this month (see Lawmakers Approve Energy Tax Credits, Bailout). "You know something's going on when Congress gets involved," he said. "I was so happy that they finally got their act together in Washington. ... It's about time and it will be great for the industry and great for the nation." With the federal government having been "asleep at the wheel" before now, California had taken the lead in green-energy policy, he said, adding that the United Nations last year invited him to speak to help push other countries in the same direction as the Golden State. "When you look on the map, we're a small place, but when it comes to the influence that we have, we're more like a continent," he said. "We're going full speed ahead and showing the country how it's done." He said SB 375, a bill signed into law last month that requires metropolitan areas to consider ways to reduce vehicle trips and congestion, will be California's next big step in fighting climate change by countering urban sprawl. He also said real action was happening in the solar industry. "I can envision going with the helicopter up and down California and seeing no more warehouses without solar panels," he said, to applause. "No matter where you look, there's solar involved. It's everywhere. "It's the future; it's now. It can't be stopped." The way things are going, he said, he'll soon be driving a solar-powered Hummer. Schwarzenegger has long taken heat from environmentalists for his choice of transportation. He ended with a reference to probably his most famous line from his movie days. "Together we'll get there," he said. "Keep shooting for the stars and I'll be back." Jim Jenal, CEO of Run on Sun, a Pasadena, Calif.-based solar installer, said that while he did not support the recall of former Gov. Davis, Schwarzenegger has won him over with his greentech policy. "A lot of politicians have talked about green jobs and renewable energy, but he's really put his muscle behind it and really made a difference," he said. "He's truly committed to this industry and I think he's proven that. In that regard, I'm a huge fan." Mario Monesterio, owner of Best Power International LLC, a solar-design and installation company in St. Paul, Minn., agreed that Schwarzenegger has taken the lead in environmental policy. "Whatever the party issues are, he's followed his own beliefs," he said. "Even though we don't always agree on everything, certainly on this, he's done good." Peter Biondo, a technical sales coordinator at Oventrop Corp., which makes solar-thermal collectors and system components, put it another way. "He's my kind of Republican," he said with a laugh.